The Atrix VACOMEGAS Omega Supreme vacuum features a self-contained filtration system that captures hazardous particles as small as 0.3 micron. It includes two filter plugs, disposable bag and tie to prevent particles from escaping into the air or getting on hands and clothes when disposing filter. The lightweight and portable VACOMEGAS Omega Vac is made from a high-impact styrene construction for durability and long life. ESD-Safe, the conductive construction provides maximum static protection to safeguard the operator and sensitive electronic components. Ideal for soot, pollen, black toner, and most color toner. static protection to safeguard the operator and sensitive electronic components. Prevents EMI/RFI noise from entering the line. All accessories store conveniently under the plastic cover insert. Provides continual operation with no clogging. Crush proof. To get to those hard-to-reach places! To loosen dust and particles in tight areas. 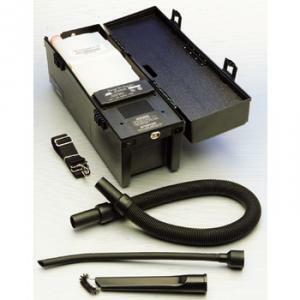 The Omega Supreme Electronic Vac features an electronic line filter that suppresses EMI/RFI noise. Its quiet flow-through motor and sound baffles make it the quietest electronic vacuum on the market today. Omega Supreme Electronic Vac is made from a high-impact Diamond ABS Polymer for durability and long life. It comes complete with all accessories listed above, which are statically conductive for maximum static protection, and a shoulder strap. It also features over-heat protection and field replaceable latches.